Meanwhile, in Beligium, a young woman has done something that she might not have done if she had the intelligence of Jezamine Lim. She got 56 star tattoos. On her face!!!!!!! Now I like tattoos on women – and I have featured quite a lot of tattoo babes on this blog - but this is taking things way, way too far. And even Kimberley Vlaminck is regretting getting the tattoos. But that’s hardly surprising. 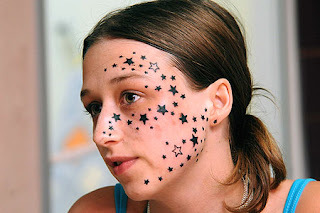 I mean, can you imagine going home to your parents with 56 stars tattooed on your face?!!! But now the realization of her stupidity has set in, and she doesn’t like what she sees in the mirror. "I can't go out on the street. I am so embarrassed. I look horrible." she complains. So Kimberley has decided to shift the blame to her tattooist, claiming that she had “only” asked for three stars and that the other stars were tattooed on her face after she had fallen asleep in the tattooist's chair!! And she is suing the body artist for 10,000 euros!! If she wins I guess she’ll have to use the money for laser treatment to get the tattoos removed (perhaps she could ask Jezamine Lim to do it?). But let me tell you one thing - it certainly won’t be enough money to buy her a new brain!!!! Would like to do a link exchange with you..
"You are showcasing Asian values to the world at large. Thank you for spreading the word and doing a fine job!"